I carefully select those to bring with us, focusing on books we’ll both enjoy and want to reread. After several years, most books recede far enough into memory that rediscovering them is a pleasure. Since airlines have cracked down on weight limits, prudent book selection is more important than ever. Two years ago my parents sent us the first six volumes of Andrea Camilleri’s wondrously good Inspector Montalbano series, set in Sicily and skillfully translated by poet Stephen Sartarelli. A few pages into the first book, I realized the series was perfect for the island. I quit reading and put the Camilleri books in my “bring to the island” corner. Then my head exploded and I was off reading for longer than I’d planned. Shortly before we left for Greece this year, to my great joy, I finally was able to read books again. I dug out the Montalbano series and packed them for the trip. I began getting to know Inspector Montalbano our first day on the island. One week later, thoroughly captivated by the cantankerous, world-weary, enigmatic inspector, I finished the last of the six books. I’m already looking forward to rereading them, but first I’ll track down and devour the rest of the series. To judge from the entrance the dawn was making, it promised to be a very iffy day – that is, blasts of angry sunlight one minute, fits of freezing rain the next, all of it seasoned with sudden gusts of wind – one of those days when someone who is sensitive to abrupt shifts in weather and suffers them in his blood and brain is likely to change opinion and direction continuously, like those sheets of tin, cut in the shape of banners and roosters, that spin every which way on rooftops with each new puff of wind. Inspector Salvo Montalbano had always belonged to this unhappy category of humanity. 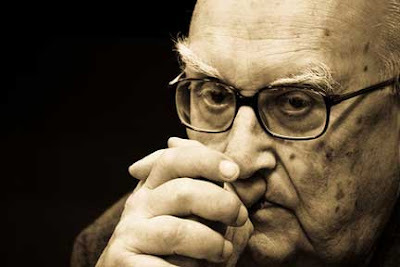 Camilleri’s prose brings Sicily’s people, and its highways and byways, vividly to life. In the original Italian, Camilleri uses Sicilian dialect to create colorful characterizations and bring humor to stories that might otherwise be overly dark. Sartarelli effectively captures the dialect’s essence in his creative translation. Inspector Montalbano loves to eat, and insists on doing so silently, the better to appreciate every nuance in the dishes set before him. He thinks poorly of those who cook badly, and when forced to eat bad food (“… shamefully overcooked pasta, a beef stew conceived by an obviously deranged mind, and dishwater coffee of a sort that even airline crews wouldn’t foist on anyone…”), he heads out for a meal good enough to lift him out of the gloom into which bad food plunges him. “Well, signora, thank you so much …,” the inspector began, standing up. Montalbano felt his stomach blanch. Signora Clementina was sweet and nice, but she probably lived on semolina and boiled potatoes. “Jesus!” said Montalbano, sitting back down. “I’m staying,” the inspector replied decisively. Although food plays only a supporting role in the Montalbano books, Camilleri’s descriptions of traditional Sicilian dishes are inspirational. I read the above passage just before lunch and, coincidentally, had the ingredients on hand to make Pasta alla Norma. So I did. Montalbano was right to stay for lunch with Signora Clementina. Eggplant and Tomato Sauce with Spaghetti is absolutely delicious. Pasta all Norma comes from Catania, a city in eastern Sicily, and is named after Catania native Vincenzo Bellini's famous opera, Norma. Traditionally, eggplant for Pasta all Norma is fried, as described by Signora Clementina. Because fried eggplant absorbs a lot of oil, I oven-roast it instead. If you want to fry the eggplant, sprinkle the eggplant slices with a lot of salt and let drain for an hour or so (salt collapses eggplant’s cell structure and helps reduce its oil absorption). Rinse off the salt, pat the eggplant dry, fry in olive oil until the slices are golden brown, and drain on paper towels. Make the Tomato Sauce: Put the tomatoes, onions, basil and salt in a large pot and cook over medium heat for 15 minutes, stirring regularly. Put the tomato mixture through a food mill to remove the skins and seeds. Return the tomato mixture to the pot with the olive oil and sugar. Bring to a boil, turn down the heat, and simmer for 30 minutes, stirring regularly. Taste and add salt, as needed. Make the Eggplant: Preheat the oven to 450°F. Slice the eggplant into 1/2” cross-wise slices. Brush the slices on both sides with olive oil and season with salt and freshly ground black pepper. Bake the eggplant for 15 minutes or until the eggplant slices are golden brown, remove from the oven, and let cool. Cut into 1” wide slices. Add the eggplant to the tomato sauce and stir gently, being careful not to break up the eggplant slices. Make Pasta alla Norma: Cook the pasta in boiling, salted water until it is al dente. Drain the pasta, reserving 1/2 cup of the pasta water. Return the pasta to the pot and stir in the reserved pasta water, olive oil, garlic, and freshly ground black pepper. Add all but 1 cup of the Tomato and Eggplant Sauce and toss with the pasta. Pour the sauced pasta into a large bowl and top with the remaining sauce and crumbled cheese. Serve immediately. This is my entry for Novel Food #5, hosted and created by Simona of Briciole and Lisa of Champaign Taste, both of whom love Inspector Montalbano. You can find the Novel Food #5 round-ups here and here. I brought books, magazines, etc back from Greece and boy did it add weight to me baggage. 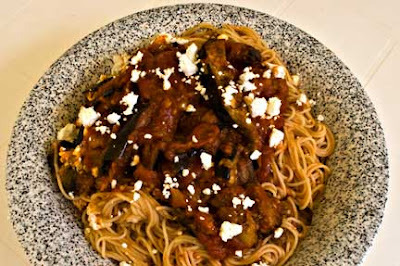 Eggplant is great for no-meat Fridays and I you pasta dish sounds wonderful, save for the feta which I find to be a little strong here. Oh, Laurie—this is wonderful! I, too, am a devotee of the Montalbano books (my own posts for two of the Novel Food events have been about food from the novels). I'm on tenterhooks waiting for the next one to become available in English. You've written a marvelous post that does justice to both the books and the pasta. :) I've been eating a lot of eggplant lately but hadn't thought of pasta alla Norma. That will be my next eggplant concoction! I can even get ricotta salata in my small city, which is a bonus. Thanks so much for joining in on our event. Simona and I both love reading all the posts, finding out about new books or being reminded of old, etc. It was so entertaining to read this post. It's fantastic that you drew inspiration for lunch from the books that you're reading. It's so good to know that you're enjoying your fresh veggies...it sounds like you're really enjoying yourself. Yay!! ....it's nice having you in the same time zone! I love your selection of excerpts! And pasta alla Norma is such a great dish. I also roast the eggplant to keep dishes light. Thanks for your contribution. I am glad Montalbano was a great company during your vacation. Interesting reading Laurie. I really love the simplicity behind this dish. Eggplants and tomatoes are the perfect pair when it comes to cooking. Really a lovely post. And I am so happy to hear that you're able to enjoy reading again. How really delightful! Your dish looks wonderful. I've put the series on my library list! Thanks Maria! 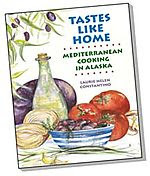 I do favor books with a good food angle - are you shocked?? Peter M, I know exactly the problem you are describing with baggage weight limits. We struggle with it every year. Between the books and the food, we have a hard time getting everything home. Although it does look like feta, the recipe used myzithra or ricotta salata, both of which are mild and suit the recipe. Lisa, I can't wait to get back to the US and buy the rest of the Montalbano books - I appreciate Camilleri's sardonic attitude. Thanks to both you and Simona for organizing this Novel Food - it's my favorite of all food events because I always discover new books I want to read! Cheryl, I do love being in this time zone! How anyone can not eat their fill of fresh vegetables while in Greece, I can't understand. We rarely eat meat here and when we do it's usually mixed with veggies. Yum! Simona, glad to know I'm not the only eggplant roaster! As I said to Lisa, thanks so much for putting together the Novel Food event - the best on the net! Peter G, maybe eggplants and tomatoes go together so well because they're both members of the nightshade family?? Whatever the reason, you're so right - they're the "perfect pair." Mike, maybe you should buy a case of eggplant and work your way through them! By the time the case is gone, you'll be an eggplant guru! Sophie, you never know what might change a mind - if there's ever an eggplant recipe to do so, it's this one, for exactly the reasons you say, the flavors are just fabulous. Kiwi, too funny! I can't wait to start learning about your taste in literature! Kalyn, thank you so much. HalfCups, I hope you enjoy the books as much as I did! Bijoux, I agree with you completely about the marvelous recipes for eggplant in the Mediterranean countries. As much as I love eggplant, there's really nothing worse than when its undercooked, sort of a combination between rubbery and cottony - yuck. Although I don't have a problem with eggplant, there are definitely ingredients I don't tell hy husband about until he gives a dish his stamp of approval (and sometimes not even then...). As my grandmother said often, "don't tell everything you know." Val, that's so sad about your cousin. Aneurysms can be devastating (assuming you survive). Life is precious indeed. This blog is part of my celebration of it. Haven't tried pasta alla norma but now I have something to look to when I do. Thanks! Bookmarked. This does look fabulous! Just found this! Love this blog, great looking flavors & recipes!